PARIS — When students from The Calvary Academy first saw Notre Dame Cathedral Monday, they were under the impression they would revisit the historic site later in the day. Instead they would be among those to witness the destructive fire. The students from Cincinnati are in Europe as part of a high school trip, said principal and chaperone Stephanie Bienz. Notre Dame was an unquestionable stop on the Paris leg of their trip. "We had just a limited time in there, so I led my students around hoping to come back," Bienz said, "to show them the rest of the cathedral — showing them the outside of the cathedral — but unfortunately that did not happen." 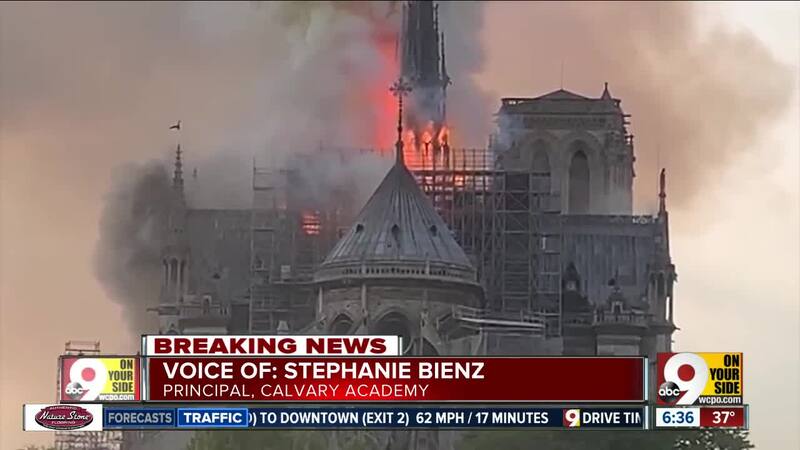 Bienz said the group went to dinner just blocks away before attending a concert at the Sainte-Chapelle, located within walking distance from Notre Dame. The students saw thick smoke as they were leaving dinner. "As we're walking up, there's all of this smoke billowing out," Bienz said, "and my students are a little concerned, 'Miss Bienz is this okay, are we fine?' And I'm texting the person we're meeting like, 'Is this real, are we okay?' They said, 'Yeah, we see the fire, you're good to keep coming.'" The concert ended at about 9 p.m. That’s when the students were escorted from the Île de la Cité — the island within Paris where Notre Dame was built. The Calvary Academy students woke up Tuesday to see the fire was out, and the cathedral had been gutted. Their trip through Europe continues until April 20, according to an online school calendar. 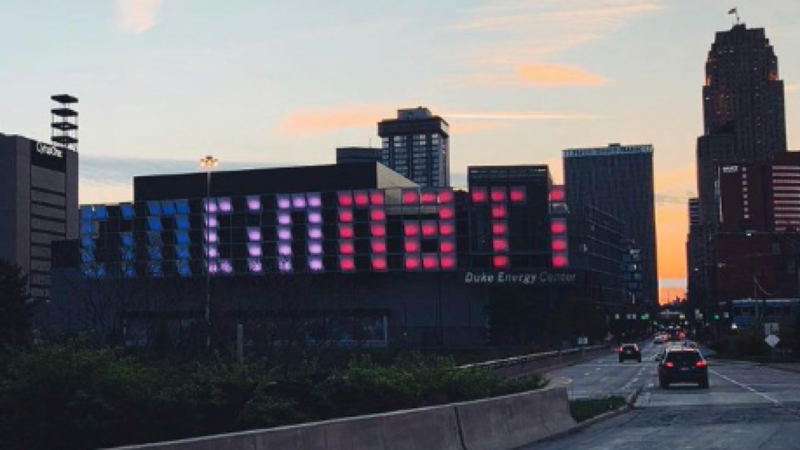 Cincinnati is paying tribute to the city of Paris. Tuesday, the lights outside the Duke Energy Convention Center were lit in the colors of the French flag. Montgomery officials posted photos from a 2015 trip to Notre Dame, posting on Twitter, "Our hearts break for our #SisterCities friends in Neuilly-Plaisance Ville and France." Archbishop Dennis M. Schnurr released a statement Tuesday, and said the Archdiocese of Cincinnati joins in prayer with millions of Catholics around the world. "The holy site has been a place of beauty and prayer for millions throughout the centuries," Schnurr said. "We pray for all those who mourn the devastation to this iconic church and we look in anticipation to Christ’s Resurrection for hope to renew the Cathedral at Notre Dame and the Church."